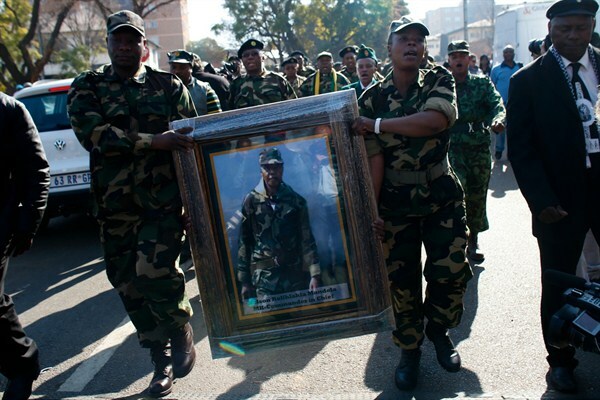 Members of Umkhonto we Sizwe, the armed wing of the African National Congress in South Africa, hold a frame photograph of former South African President Nelson Mandela, Pretoria, South Africa, June 20, 2013 (AP photo by Markus Schreiber). Former Iraqi leader Saddam Hussein’s devastating military defeats in 1991 and 2003 demonstrated that taking on the U.S. military in conventional battles is a very bad idea. Knowing that, some of America’s adversaries, like Russia and Iran, turned to what security experts call the “gray zone”—methods that relied on proxy forces, psychological warfare and other provocations at a level that would not compel U.S. intervention. Extremist groups like al-Qaida, the Taliban and the self-styled Islamic State cannot muster the resources for full-on gray zone aggression even if they wanted to. This has forced them to rely on insurgency instead. Luckily for the United States, they’ve been doing it wrong.